Search type  use the menu to choose Word match (with word variations), Exact character match (except for case), or Exact character match (including case). The Search the Web button  Click to use the terms specified in the content field for a Google search of the website docs.intersystems.com. Books and articles  Select the title of a book, or keep the default all books and articles. If you know which book contains the information you are seeking, use this to restrict the search to results within that book only. All other results are grouped by topic, and display up to nine hits for the search term within that topic. A topic could be a chapter, an appendix, or an entry in a reference, such as this entry on $PIECE. If there are additional hits within that topic, the page will display “Topic has more results.” Each finding is displayed below its closest parent heading to help you determine which result will be the most useful for your search. Choose a search type from the second menu. The default search type is Exact character match (except for case), which searches for an exact string but ignores the case of the search term. If you do not know the case of a search term, use Exact character match (except for case). If you know the exact capitalization of a term, select Exact character match (including case) to further restrict results. The search engine also supports the InterSystems IRIS Word match (with word variations) (sometimes called a “stemmed search”). This kind of search is based on an extensive list of related forms of words. For any word appearing in the list, the search engine takes the stem of each word provided and finds all matches associated with that stem. For example, save, saving, and saved all yield the same results. The order of the results is the same for all variants of a particular stem (for example, regardless of whether a search is for save or saving). Note that words which contain the same string are not necessarily stemmed variations of each other. For example, a stemmed search for the word “user” does not return results including username. The search engine supports stemmed search for most words. 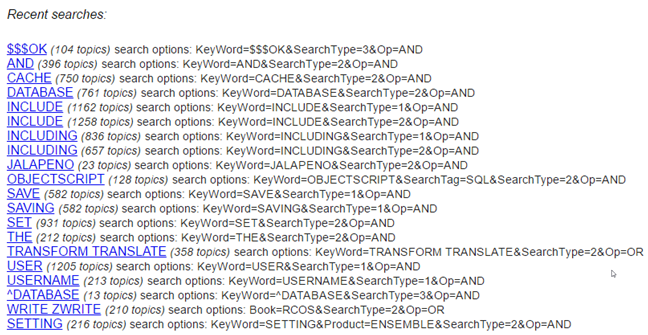 For words with forms that are relevant to InterSystems products, search may not support all forms of stemming. For example, include and including return different sets of results, since “include” is a reserved word with a specific meaning in some programming languages. For details on free-text search, see the section “Using Free-text Search” in the chapter “Querying the Database” of Using InterSystems SQL. The free-text search will ignore non-alphanumeric symbols, with the exception of the special characters “$” and “%,” which have special meaning in ObjectScript commands and keywords. If your search text includes non-alphanumeric symbols such as a caret (^), use exact character search to make sure they are included in the search query. For example, if you are searching for the routine ^DATABASE, but you do not want to do a general search for the word database, use exact character search to narrow your results. The search engine indexes words that include é as if they contained e; it also indexes words that include ñ as if they contained n. Hence, to search for the word “touché”, simply enter touche for the search; to search for the word “cache,” use cache. Similarly, use Espanol instead of Español. Do not put quotation marks () around the search term unless they are, themselves, part of the search item. Corresponds to the Search Type menu. For this parameter, 1 corresponds to Word match (with word variations), 2 corresponds to Exact character match (except for case), and 3 corresponds to the Exact character match (including case).